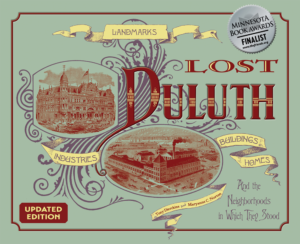 Until the Interstate Bridge was stretched between Duluth and Superior in 1897, the only way to get to and from the cities was by ferry boat. 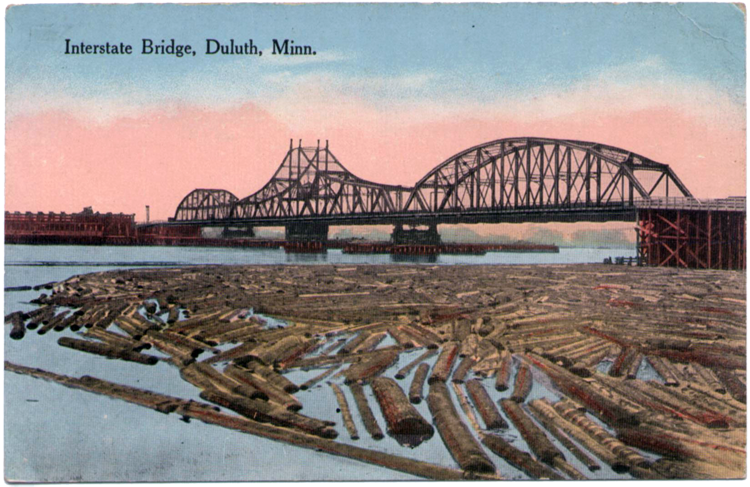 While Congress had passed a bill allowing a toll bridge between Duluth and Superior in 1890, disagreements between the two cities delayed construction for years. The bridge, designed by A. P. Boller and operated by the Duluth-Superior Bridge Company (a subsidiary of builder Burlington Northern), spanned 1,094 feet between Duluth’s Rice’s Point and Superior’s Connor’s Point. The swing-arm bridge was built in three spans; the 486-foot center span swiveled to allow shipping traffic to pass. The Interstate Bridge “opened” on April 23, 1897, with Mayor C. S. Starkweather of Superior calling the event the “marriage of Helen and Troy.” Like the Trojan horse itself, the opening was a deception—in this case, to give the appearance of compliance to the bridge’s charter. Work hadn’t actually been completed on the Superior side, much to the chagrin of a farmer from Tower, Minnesota, who tried to cross in an ox-drawn wagon. When it was first placed in operation the bridge welcomed pedestrians and horse-drawn vehicles and carried two railroad tracks and a streetcar line. Everyone paid a toll: five cents for pedestrians and bicycles, fifteen cents for wagons, and a dime for each head of cattle. The first hours of August 11, 1906 were rough on the bridge, as well as the steamer Troy and her captain, Robert Murray. Around one am the Troy—all 398 feet and 3,665-tons of her—slammed into the still-opening swing span, knocking a two-hundred-foot piece of steel into the bay and buckling the northern span, which collapsed, blocking all traffic on the bay and trapping thirty-three ships inside the upper harbor. Clearing the channel took almost a week, costing each trapped vessel’s operators about $1,000 a day. Engineers spent nearly two years restoring the bridge while a tug and barges transported pedestrians and wagons across the harbor. Over the years the bridge was refitted for automobile traffic; the streetcar line was removed in 1938 and by 1949 only one railway track was in use. The Duluth-Superior High Bridge (later renamed the Blatnik Bridge) was built in 1961 to replace the Interstate Bridge so longer ore carriers could navigate in the harbor. The Interstate Bridge was dismantled in 1971; its northern span, off Rice’s Point, was retained as a fishing dock. St. Louis Bay once had three swing arm bridges: the Interstate Bridge, the 1887 Grassy Point Railroad Bridge (which still operates), and the Northern Pacific Railway’s 1885 St. Louis Bay Bridge (shown in the photo above to the left of the Interstate Bridge), which was dismantled in 1986.